1967 Chevy Corvette 427 with a 4 speed Photo Picture Classic Cars for sale & Classifieds - Buy Sell Classic Car & Classic Truck Classifieds. Folks need to leave 5 W's on these cars when they post pics so that enthusiasts can attempt to rescue them. This reminded me of a 1966 L79 (350hp/327)/4 speed convertible my uncle restored back in 1981. the car had been in a garage fire when he bought it. (luckily the only damages was to the top, the windshield, and a small portion of the front of the car. He ended up replacing the entire interior because of smoke damage. By the time he was done with it, it was one hell of a nice car. Please someone come help that one !!! 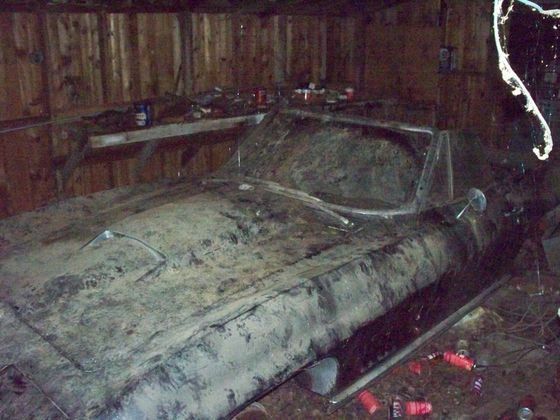 Such a shame to let that beauty take crap in an old abandoned shack... One of my friends has a '63 "Split" Vette! He's one of the only 3 guys having that car in France (I am French...), and that's really a fantastic car !! somebody better restore that! its probobly another "going to fix it up some day"
Does anyone have any details on the location of this Vette? I hope she is being restored.